It was Plato, a Greek philosopher and student of Socrates who first spoke of Atlantis. 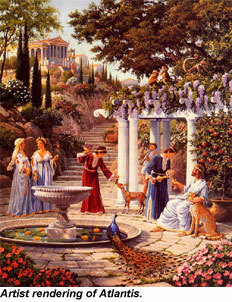 Plato told the stories of Atlantis through characters in his plays. Plato insisted that Atlantis was real even though many thought he made it up for his plays. Every race and religion has a story about a great flood that destroyed an entire civilization. 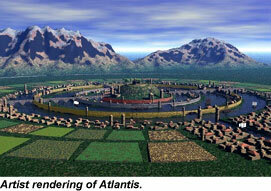 Plato claims that Atlantis was a large island in the Atlantic Ocean somewhere west of the Rock of Gibraltar. This description leads some people to believe that Atlantis may have been the Aegean Island of Thera, also known as Santorini that suddenly blew up. Some even say that the Bermuda Triangle was created by the sinking of Atlantis. It is believed that some of the Atlanteans survived the demise of their island. Plato claims that the Atlanteans were superlative and blessed people but had lawless ambition and power. They began valuing material wealth above goodness causing their divinity within to become faint and weak. Being unable to bear the burden of their possessions, there occurred portentous earthquakes and floods, and Atlantis was swallowed up by the sea. The area where Atlantis sunk has been impassable and unsearchable, hence the Bermuda Triangle theory. In 1973, the United Press International reported that a scientific expedition found Atlantis at the bottom of the ocean. Scuba divers found data to prove the existence of the super-civilization. They found evidence of roads and large columns, some with concentric spiral motifs in the exact place as described by Plato. The expedition revealed over 30 ruins including pyramids, domes, paved roads, rectangular buildings, columns, canals, and artifacts that have been found on the ocean floor from the Bahamas to the nearby coasts of Europe and Africa. Dozens of historians have written about the existence of Atlantis and how the Mayans and Aztecs have told that their conquerors came from Atlantis and Mu. They have written about ancient tablets photographed in Peru showing the two lost continents, Atlantis and Lemuria, and of ancient maps clearly showing Atlantis. In 1970, Dr. Ray Brown and four divers explored the ocean floor off the Bahamas and discovered a pyramid, roads, domes, rectangular buildings, unidentified metallic instruments, and a statue holding a “mysterious” crystal containing miniature pyramids. After analysis of the crystal and the metal devices, it was discovered that the crystal amplified energy that passed through it. Explorer Dr. Mansan Valentine photographed and published his findings in the 1960’s of ruins and buildings off Binini Island. Similar ruins were photographed off Cay Sal in the Bahamas and Morocco 50 to 60 feet underwater. Tony Benlk (reported finding a huge 11 room pyramid 10,000 feet under water in the mid Atlantic Ocean. Ari Marshall’s expedition photographed the huge pyramid found off Cay Sal in the Bahamas in 1977. It is said to be 150 feet under water with the pyramid itself being 650 feet high. Instead of black water surrounding the pyramid, it is surrounded by green water and the water is lit by sparkling white water flowing out of the openings in the pyramid. A Soviet expedition led by Boris Asturua found a sunken city about 400 miles off Portugal that had buildings made of extremely strong concrete and plastics and streets that suggest the use of monorails for transportation. The famous ruins of Troy were discovered by explorer Heinrich Schilemann who also found a bronze vase made of an unknown metal. He left a written account of this in the famous Priam Treasure. Inside the treasure are glyphs in Phoenician. The Phoenician’s claim they are from King Chronos of Atlantis. Identical poetry was found in Tiajuanaco, Bolivia. An underwater marble acropolis spreading across 5 acres of fluted columns raised on pillars has also been discovered. There are many examples of buildings, roads and columns made of materials not available in their areas. Ancient maps that Christopher Columbus used before sailing to America are said to show Atlantis. The Aztecs, Myans, Greeks, Egyptians, Spain, India, Tibet, and islands in the Atlantic and Pacific oceans all speak of ancient sunken continents that they are connected to in the writings. All of these discoveries were made public in daily newspapers when they were discovered, but because historians cannot explain the human footprints and shoe prints, perfectly engineered cubes, jewelry, the prehistoric animal with a hole in its skull that scientist admit could have only been made by a bullet, a remnant of a screw, and other modern artifacts, these discoveries have been left out of the history books. The Atlantean’s technology was far superior to our own. One of their greatest accomplishments was perfect weather control. They became bored with the endless summer weather and longed for the storms they loved so much. After all, the Atlanteans came into the physical world for stimulation. Therefore they controlled the weather by creating violent storms. They also controlled geological events such as volcanic fountains, steam and mineral venting for artistic results. The Atlantean’s had technology that our military is highly attracted to known as “threshold” technology. This is a solid device with no selectable dial that uses time/space as an energy source. The threshold is a lens into probable existence streams, or continua. There was mention of this in the movie “Stargate” and researched by the Government in what we know as “The Philadelphia Experiment”. As was told earlier in this article, there was a crystal found that scientists discovered would amplify energy as it passed through the crystal. Crystals have the ability to transfer, retain and maintain intensity of energy. They can use them to focus and transmit energy over great distances to similar receivers that are equal or comparable to the transmitter. The Atlanteans used these crystals to transmit energy from one pyramid to another. When the face of the earth was directed toward a certain point, one pyramid would function to intensify and transmit energies to other pyramids that would then act as receiving devices and would disperse energy as it was needed. When the pyramid was at an unfocused point, the other pyramids would then become the transmitters. It was a very simple and effective method that would bring them many troubles later. Atlanteans sped up the growth of their natural crystals to produce crystals as high as 25 feet and 10 feet in diameter. They had 12 sides and they were used for storing and transmitting power. Smaller crystals of about 4 or 5 feet were infused with different colors, and had a variety of facets to be used for different purposes such as healing, mediation, psychic development, increasing mental capacity, communications, powering generators, dematerialization, and transport of objects, magnetic force fields, and travel at speeds undreamed of by today’s culture. Some of the crystals were inverted with four to six sides and infused with various shades of pink or rose. These were used as light beams for surgery by changing the molecular structure. They were also used for soothing pain in areas to include the brain, the eyes, the heart and reproductive organs. Crystals infused with yellow or gold change to deeper hues of gold and yellow if there was a presence of disease or bodily vibrational disorders. Crystals infused with Ruby and purple helped cure emotional and spiritual problems; and black crystals were powerful protectors. The Atlanteans were said to meditate for 15 or 20 minutes inside a circle of 6, 111, 22, or 24 different types of stones while holding a clear quartz crystal in their hands. The clear quartz acted as a controller or focalizer. This practice was said to bring rejuvenation and a return of vitality allowing them to live hundreds of years while maintaining a youthful appearance. The crystals received their power from the Sun, the Earth’s energy grid, or each other. The larger crystals known as Fire Crystals were the central receiving and broadcasting stations, while others acted as receivers for individual cities, buildings, vehicles and homes. Rooms made of crystals were a place where those with secret knowledge on a spiritual level left their bodies in their final transcendence. Edgar Cayce mentioned the Fire Crystals many times. He claims they were housed in a special oval shaped building that had a dome that could be rolled back allowing the crystal to be exposed to the Sun, moon, and stars during favorable times. It appears the crystals gathered solar, lunar, stellar, and atmospheric and Earth energies as well as unknown elemental forces concentrating these at a specific point, located between the top of the crystal and the bottom of the capstone. They were used for to transmit currents of energy throughout the land, the sky and under the sea at the speed of sound. They were also used to transmit the human voice and pictures over long distances. They used the crystals extensively for many things such as extracting this and that from the same basic substance and using the division of energy to be able to grow things. Some divisions of energy were also used for healing, knowledge or to increase substances. They also used them to disassemble molecule structures, combinations of this stratum to build and assemble structures such as chains and the transmutation of matter. This extensive use of crystals is what led to the Atlantean’s becoming greedy for power. They tuned the great crystals to higher and more destructive frequencies, activating volcanoes and melting mountains, causing the catastrophe which caused Atlantis to sink in the ocean and possibly the shift of the Earth’s axis.